Embassy Suites by Hilton, 3600 Paradise Road, near the Convention Center, ideal for business trips. 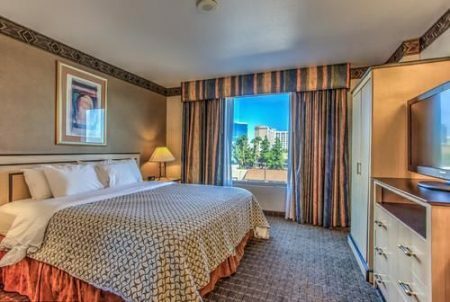 Embassy Suites by Hilton Convention Center Las Vegas is an excellent option for both people visiting on business and for pleasure. 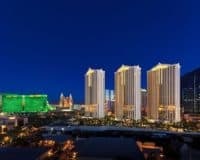 It lies East of the Strip less than a mile from the famous Vegas Convention Center, which makes it ideal for business people attending conferences there, while it is also close to the Vegas monorail, which will take you directly into the heart of the entertainment capital of the world. The hotel offers a great range of amenities that will make your stay there relaxing and convenient. 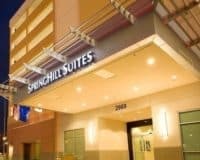 These include a heated indoor pool, along with a glorious outdoor sun deck where you can catch some rays; a fitness center, which is well equipped and open most of the day; and a relaxing spa and hot tub, the perfect way to blow off steam. There is also a huge choice of places to eat and drink including stylish cocktail bars and places serving all American classics. The hotel also offers complimentary breakfasts cooked to order and free cocktails and snacks in the manager’s reception, a lovely touch, which you are sure to take advantage of during your stay. The rooms are comfortable, spacious and modern, offering 42-inch flat-panel televisions, equipped with cable, comfortable living quarters, with workspaces and leather sofas. Along with all the other usual things such as WIFI and pretty much anything else that you could desire. The Embassy Suites by Hilton Convention Center Las Vegas is a symphony of luxury and functionality, making it ideal for Vegas visitors, coming for both business and pleasure. 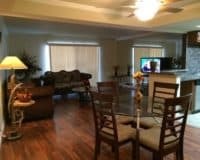 The staff are friendly and helpful, meaning that you are guaranteed to get the maximum from your stay in Vegas.